The world of fermentation has always been flooded with traditionalists. 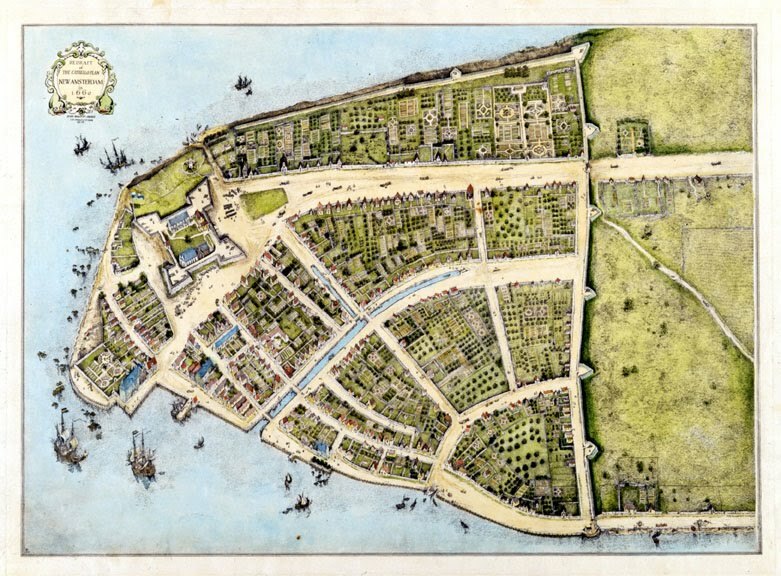 Year after year, production of historically accurate beer, wine, and liquor is continued and to great success. From a quality and marketing perspective, consumers do enjoy tradition. But like in any long existing industry, technology and innovation find their way in, leading the trend setters into new, uncharted territory. To round out the little alcohol industry series on the Nobler, I decided to focus today’s post on beer. We’ve seen how the distillation legislation has changed the game for liquor, and how US wine consumption is off the charts but there may be no more obvious expansion and growth, than in the US beer market. Craft beer has all but taken over the previously popularized term, microbrew, but no matter how you call it, you can’t help but be pumped about what’s on the market today. To think, that I can walk down the block to my local grocery store and find Saison style ales next to the six pack of Bud Light Lime, sort of says it all. Even European consumers have taken note, now demanding US craft beer overseas. One of my favorite trend-setters these days is the Allagash Brewery in Portland, Maine. Their specialty beers are thoughtful and delicious, like this pair of wine inspired beers the Victoria and Victor. Allagash mashes in Chardonnay and Cabernet Franc grapes respectively and ferments directly with the barley grain. The result is mind-blowing. But the innovation in beer isn’t just in style and quality. As more and more beer production has been generated via this craft beer demand, the waste streams have become near unmanageable. The leftover mash/water mix is pretty terrible for the environment and folks in the industry have been looking for solutions for years. Well over the last half a decade or so, breweries have looked to yet another microorganism to help them in their processes. This time asking help from anaerobic bacteria instead of the yeast they rely on for fermentation. These little guys digest the mash purifying the waste to some degree but maybe more interestingly, create methane gas and CO2 in the process. These byproducts can be harnessed for energy and in some cases, like the Saranac Brewery in Utica, NY it is expected that this process could replace up to 40% of the current energy utilized. In this example, the beer may not taste any different, but the focus on the future is what makes the US craft beer market so fascinating! But for the Oskar Blues Brewery it was actually a bit of the past they took advantage of. 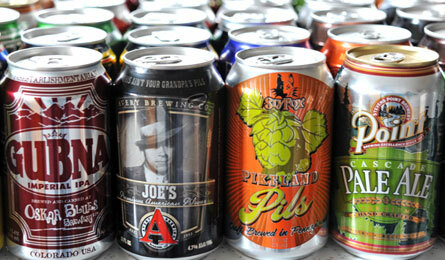 Because for years, canned beer had a stigma. And that stigma did not fly with craft beer. But for increased efficiency in distribution and storage and a serious dip in costs, cans were the way to go for founder, Dale Katechis. And the decision was obviously wise. Many other brewers have jumped on the bandwagon and now it’s just as easy to find your new favorite in a can as you would in a bottle. By reducing the packaging costs, Dale also managed to lower the hurdle of pricing for his consumers. Making craft beer just a bit more access-able, has simply opened the flood gates. Starting to make sense why this part of our economy is expanded in spite of all the other BS out there, isn’t it. And what perfect timing to mention BS. Tonight’s the next debate! Hope you all enjoyed the little mini-series! Sorry for the lack of posting late last week. I was the victim of awful hotel wifi! But anyways, it’s just as well we continue our US spirit industry posting with some wine on a Monday. Nothing eases you back into the work week like a good glass of wine. Or in this case, some facts about wine. It really is quite amazing the availability of wine these days. And while the fine wine collectors have been steady with their interest, it’s the average wine consumer that is making all the difference. Just look at the wine consumption data provided by resident wine expert, Adam. Those numbers are pretty wild. 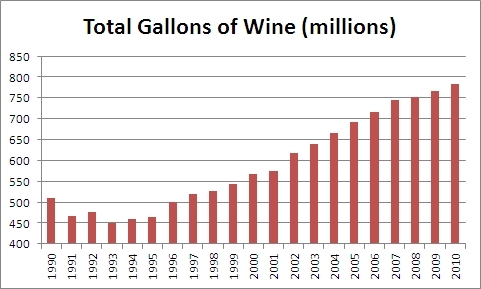 From 1993 to 2010 US wine consumption almost doubled! It shouldn’t be all that surprising, right? Walk into any wine retail shop these days and the number of bottles is in fact overwhelming. Expanded domestic production in the big 4 (NY, Washington State, Oregon, and California) plus a growing number of import regions has made the US number one (by volume) on the world’s wine consumption list. We’re number 1! We’re number 1! There is one down side to this expansion however. For most of us, who love wine but don’t have the time or the patience to research the wines that fit our expectations in a given price point, we are left with two somewhat frustrating options. The first, which I have become victim to before, is to overspend. By grabbing the bottle just above your price range, you hope to minimize the risk in being left with a crappy bottle. In the end, you are likely to wonder what made this bottle $10 more than the others and next time around default to option two. Option two, of course being to purchase the $11.99 bottle and at least reduce the likelihood of being ripped off. These bottles however, are rarely exciting. The long and the short of it is: there are just so many options! Check back tomorrow for the last post (for now) on this true US economic success story. A story of technology and innovation pushing the limits. Okay, so obviously this is a made up graph. One that I put together in about five or six seconds. But you get the point. In a time where you can’t go a half hour without hearing something about the struggling economy, Mitt Romney’s lies, and Obama’s debate flub, I’m here to tell you that we have one industry doing quite well through it all. The beer, wine, and spirit industry has seen some pretty fantastic growth over the last few years including ten percent growth in manufacturing in a 12 month period and similar results in overall sales. 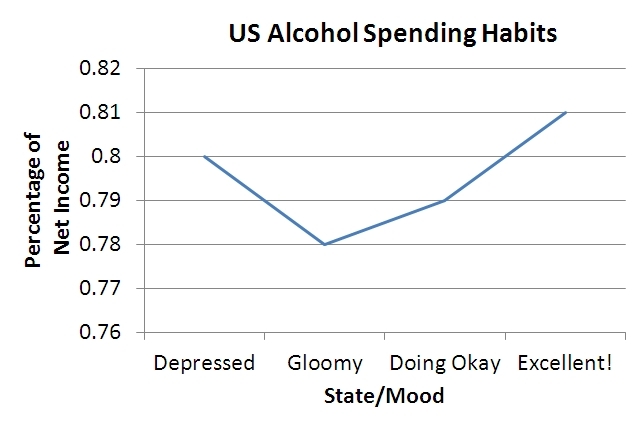 And almost by default, the answer to this curious dichotomy with the rest of our economic standing, is that when people are happy, they drink, and when they are stressed and depressed, they drink just the same, maybe even more. Well, I’m not willing to say this has nothing to do with the recent growth, but the story is a bit more interesting than that and in fact it’s a lot more encouraging. 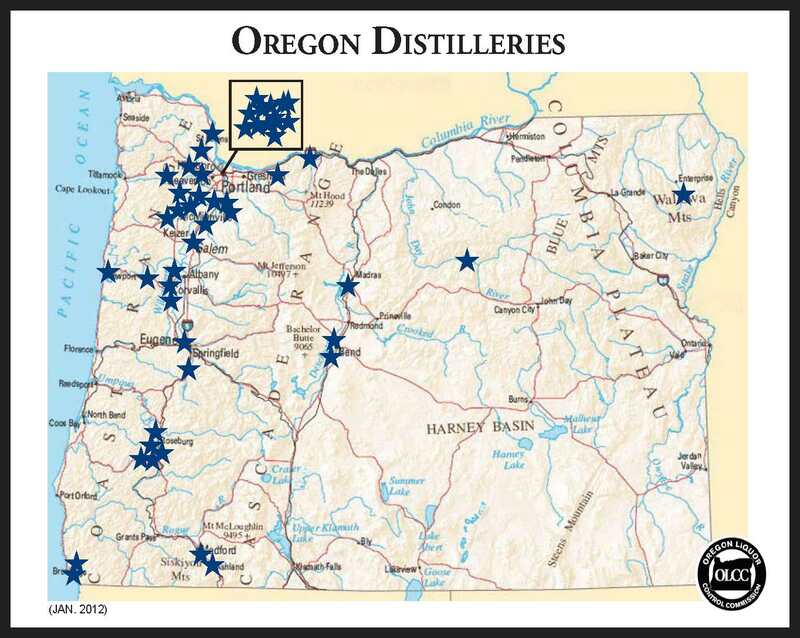 Over the next few days I’m gonna post about some of the more recent and fundamental changes that are making the US alcohol industry the place to be! New legislation, new innovation, and a whole lot of passion is making for more competition, more choice and a heck of a lot of good drinking! Stay tuned, as this is going to be way more interesting than all that political BS…and probably a whole lot more factual..
You are currently browsing the archives for the economic mini-series category.